In 1925 avant-garde artist El Lissitzky wrote his seminal essay on perspective and space: ‘Art and Pangeometry’. It traced the origins of spatiality in visual arts and examined the ability to express three dimensionality on a two dimensional surface. 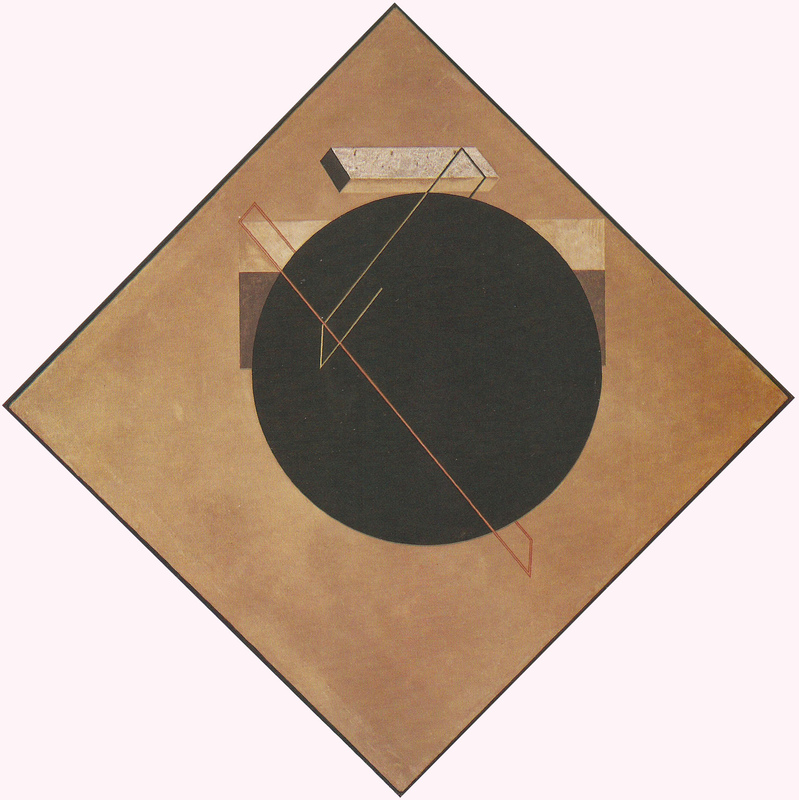 A. and Pangeometry, El Lissitzky, 1925. El Lissitzky set himself the task to explore new expressions of space which would enlarge our receptivity and constitute a new and more sensorial way of seeing, one which would create new spatial connections and consequently new ‘imaginary spaces’. 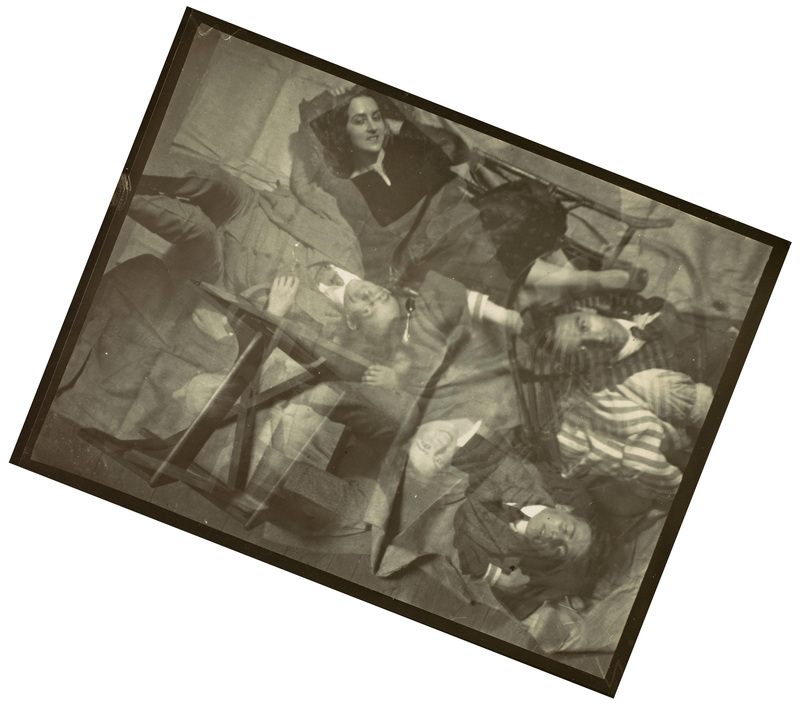 What he didn’t take into account was that through the rapid technological advancements of cinema, printing techniques and photographic processes, painting lost ground to popular culture and entertainment as a primary and guiding visual source. Walter Benjamin, The Work of Art in the Age of Mechanical Reproduction, 1936. ‘The mode of human sense perception changes with humanity’s entire mode of existence. The manner in which human sense perception is organised, the medium in which it is accomplished, is determined not only by nature but by historical circumstances as well’. The words of both texts resonate strongly even today. They take on new meaning when we realise our current society has shifted during the last decade from a consumer media age to an age in which everyone is able to produce his own images and share them instantly. Although written almost 80 and 90 years ago it seems their conceptual thoughts on the production of images, visually and mechanically, displays visionary wit and still seems to be valuable. But what exactly can we learn from re-reading these texts when we connect them to our technological era? And in what way are the questions they pose and the strategies they employ relevant for the current production of images? 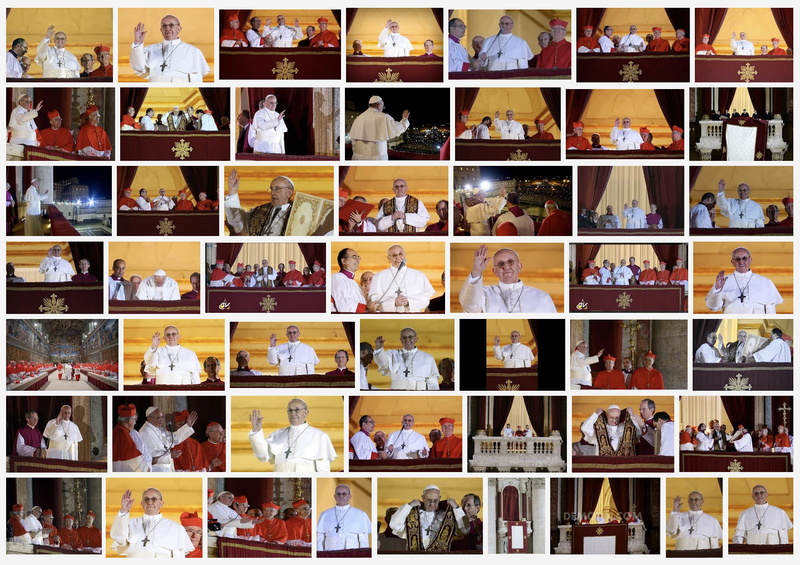 In 2005 anyone who was present and witnessed the inauguration ceremony of Pope Benedict in Rome had to look with their own eyes to experience this public event. In March 2013 the majority of people standing on St. Peter’s Square were able to film or photograph the inauguration ceremony of Pope Francis. Probably they saw most of it through their media devices or were very much consumed by the act of taking the right images and sharing them on their online profiles. The miniaturisation of technology has enabled everybody to easily take photographs and as a result important events are currently recorded from a multitude of viewpoints. In Google Image Search the amount of slightly different images produces an endless kaleidoscopic view of the same event, as if one looks through a window with thousands little rain droplets which cling to the glass. It is evident that smartphones have democratised image making and that news agencies and politics have lost their encompassing control on imagery in the news. But one can sense something else has been altered dramatically in the way we experience reality and how we relate to the world. Walter Benjamin is right when he suggests in his quote that a change in the specific reproduction of images and its distribution has far-reaching consequences and inevitably changes ‘human sense perception’. Our newly acquired camera and communication technology has quickly generated new habits in use and perception. Nowadays many people are pre-occupied with a continuous scanning of everyday life for interesting situations and reduce reality to a space for photo opportunities. And little by little we’ve come to value capturing a situation by photographic means more than just looking or experiencing. ‘The thoroughgoing permeation of reality with mechanical equipment’  distances and distracts our bodies and thoughts from a full experience and encloses our field of perception. 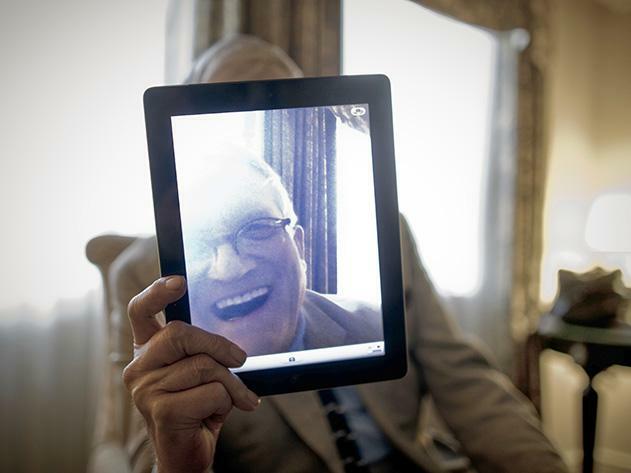 We are caught up in an immersive and symbiotic act between technology and our new habits. Anthropologist and artist David Tomas strikingly defines the invention of Hooke as an ‘imaging prosthesis’ and as ‘a paradoxical sensory amputation of the upper body’ which functions as a ‘disembodied extraterritorial eye’. He goes on to say that ‘the draughtsman’s sensorium is transposed by being encased in a close fitting helmet with one opening to the outside world which is screened out by a lens (…). One imagines that these conditions would precipitate a rapid loss of contact with the outside world, and that the process of copying an image would also function as a channel of acculturation to the instrument’s interior cultural space (…).’ Beyond the Image Machine: A History of Visual Technologies, p. 121-122, Bloomsbury Press, 2004. The increasing use of self portraiture in popular culture and social media reached preliminary new heights in the last few months. During a memorial service for Nelson Mandela in December 2013 the prime minister of Denmark, Thorning-Schmidt, was seen taking a selfie together with president Obama and prime minister Cameron. Unconsciously she introduced a new category to this phenomenon: ‘the selfish selfie’. This ‘faux pas’ for staging oneself during a funeral service whereas one should pay respect was met with a lot of criticism. But another reason why people took offence at this photo was that taking a selfie at such a major media event was even considered a possibility. Obviously they knew the world was watching, which meant this selfie wasn’t taken for the sake of the moment alone with the intention to share it amongst themselves. No, it was an act of staging as well, of ultimate self promotion, to communicate ‘we are in fact normal people having a good time’, while inscribing themselves in history and our visual culture as modern leaders through the use of popular media technology. Implicitly this affirmed that socially there are no boundaries anymore that refrain us from taking pictures of ourselves. If the presidents of this world can frame themselves whenever and where ever, why shouldn’t we? The only moral standard which remains is a personal, self-centered one: ‘if I feel like it and if it’s good for my profile I take a selfie’. The media frenzy subsided quickly but was soon to be followed by a selfie from the Oscar ceremony host Ellen DeGeneres in March 2014. The picture she shared of herself with Hollywood celebrities became the most retweeted image to date. Her selfie followed the same logic and strategy as the Obama selfie, namely affirming the social status of these well-known actors and using this prominent podium for self promotion in overdrive. Both selfies make something apparent: It re-affirms the status of the spectator as outsider and the status of the of the people involved as unattainable. You are either inside the frame or outside. Sharing the photo instantly afterwards only underlines this fact. The culture of the Selfie, of course, did not arise out of the blue. Self portraiture and portraiture have long been established as genres in the history of art. But it was the groundbreaking influence of linear perspective in the 15th century which firmly put the beholder in the locus of this system of representation. Multi-layered depictions of different times, scales or places in one single image ceased to exist as a possibility to express complicated narratives or interlocked spaces, because it was incompatible with the visual order perspective imposed. Perspective not only put the eye of the viewer in the centre and on the horizon of the picture plane, it also defined the space between objects and people in relation to the viewer once and for all. With this optical system the problem of how to render distances on a flat surface in an appealing and natural way was finally solved. Time and space fused together and simultaneously gave expression one and the same situation. For a particular space and specific moment in time perspective created a coherent optical illusion, a snap-shot. Leon Battista Alberti, On Painting, p.47-48, Yale University Press,1970. Euclid, The Optics, 300 BC. If we compare the two excerpts we notice an important continuity in thought but also a striking difference. The difference between the two projective theories at first seems modest. 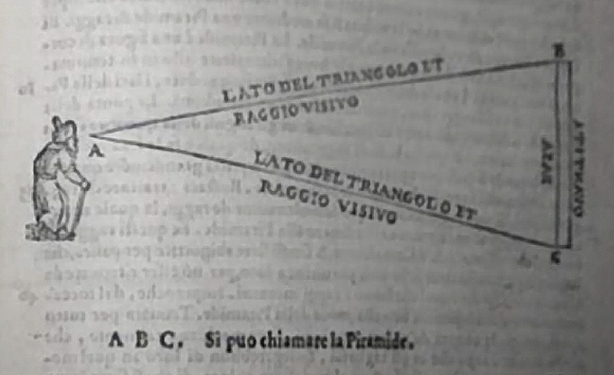 We see that Alberti substituted Euclid’s cone of vision for a pyramidal structure. The circle (at the base of the cone) was transformed into the rectilinear base of the pyramid. For Euclid the circle merely described the circumference of our ’rounded-shaped’ vision, where everything what the eye sees is located within the perimeters of this visual cone. And although both theories were based on mathematics and tried to define an encompassing structure, Euclid’s dealt more with the experience of seeing and the workings of the eye. The resemblance is unquestionably that vision is projective, whether the eye ‘sends’ rays of light like Euclid put forward in his theory or receives rays of light like modern science determined. At the time of Alberti this was still an unsolved matter and in his treatise he referred to the unceasing discussion amongst philosophers and scientists of all times which were divided on the matter of ‘extramission’ or ‘intromission’. For Alberti’s theory this problem was of less importance. He dismissed the discussion altogether and instead focussed on the characteristics of visual perception putting forward the geometrical relations between the eye and objects. Alberti brought many ideas together in his urge for conceptual and visual coherence. In his time two important scientific books were translated in Italian and Latin and became very influential. The first was a ‘The Book on Optics’ written by the Arabic scientist Alhazen in the 11th century. Alhazen compared the workings of the eye with a camera obscura and already formulated the notion of the ‘visual pyramid’, although he did not connect it to a system of representation. The second book was a treatise on cartography, ‘The Geographia’, written by the Greek scientist Ptolemy in the 2nd century. Ptolemy described three methods to project a sphere (the earth) on a flat surface, and in doing so developed the idea of a ‘central axis’ (of vision), a ‘horizon line’ and an invisible ‘grid structure’ with spatial coordinates. The real ‘surprise’ is that as a consequence a new constructive element came into being, namely ‘the picture plane’. This abstract and invisible layer created, as it were, a perfect immaterial plane for projecting space onto. However to properly depict depth and space the plane was placed in between the observer and his view. After that all the distinguished parts which laid behind it and which constitute space together, the far and near, the big and small, came together into an infra-thin and condensed layer of optical representation: the screen. In 1604 astronomer and mathematician Kepler solved the geometrical problems of image formation in the eye and offered the first theory of the retinal image. In his book ‘Astronomiae Pars Optica’ he wrote: “Thus vision is brought about by a picture of the thing seen being formed on the concave surface of the retina.” Kepler’s retinal image was a geometrical representation of the outside world inside the body. The eye had become a camera obscura. As we all know Alberti’s technique, and many others who perfected this system, had a huge impact on the visual arts. It meant that from then on any view, whether it be an interior or a landscape, was rendered in linear perspective and had a rectangular frame. Furthermore this frame which coincided with the image plane of the visual pyramid, in turn changed the painting in a ‘fenestra aperta’, a window to the outside. It can hardly be a coincidence that, at the beginning of the 16th century when Alberti wrote his treatise, paintings finally became ‘independent’ of architecture and could be detached from their context, be traded and could be put on any other suitable wall. In the 19th century, photography adopted, through the workings of the lens, the same optical conditions of linear perspective as in paintings and drawings. In relation to painting photography pushed realism dramatically with unprecedented amount of detail. In the eyes of many people it objectified reality and has since become internalised within our visual and social culture. Perspective presents us with two artificial notions which contradict our phenomenological experience. The first is that perspective is ‘monocular’ and based on the assumption that we see with only one eye. 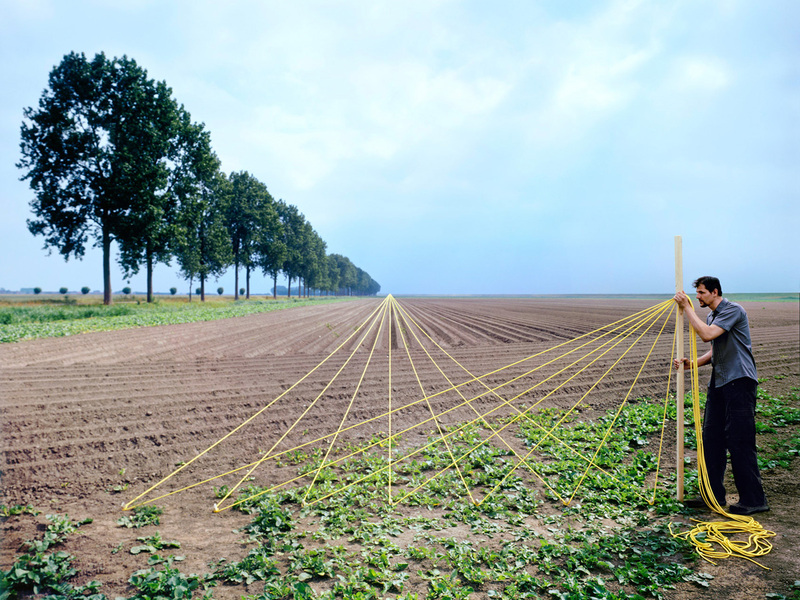 The second notion deals with parallel lines which will never converge in reality, whereas in Western perspective they coincide in a vantage point on the horizon. For more on this matter see the essay of Bejamin March. See again ‘The Work of Art in the Age of Mechanical Reproduction’ where Walter Benjamin says that ‘The public is an examiner, but an absent-minded one’. But let’s return to the questions and strategies El Lissitzky developed in his text and see if we can find clues that can be valuable for contemporary photographic practices. Like Benjamin Lissitzky is aware of the restricting parameters the optical condition imposes both on our sensory perception and on representation. In his essay he muses about a forgotten Chinese invention of an object-lens with concave instead of convex lenses as we have, which would have produced a different objective and mechanical image of the world. He is interested in a system which goes beyond linear perspective to find new expressions of space. To start his argument he first describes the ontology of perspectival space and shows two striking diagrams. In the essay ‘Proun: An Exercise in the Illusion of Four-Dimensional Space, architecture theorist Richard J. Difford quotes mathematician Henri Poincaré who similarly asserts in his book ‘Science and Hypothesis’ from 1905, that had the mechanisms that control vision been configured differently, we might have developed a four-dimensional understanding of space. The first diagram shows three images. 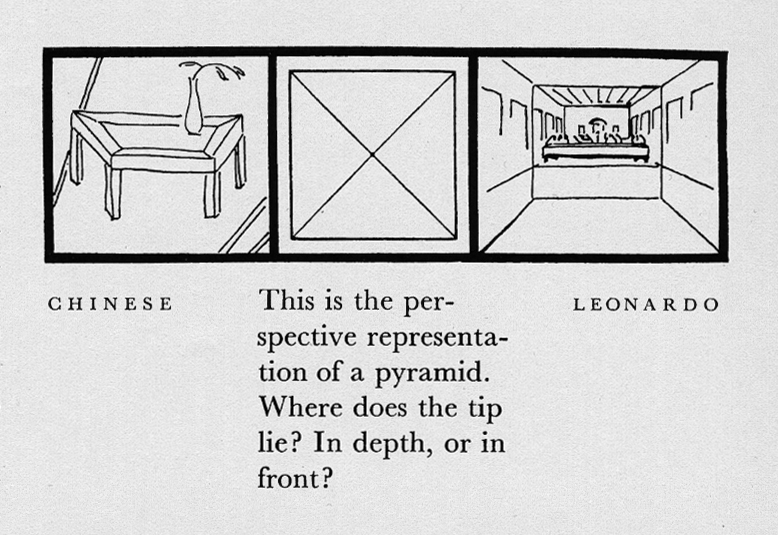 The left image, which he calls ‘Chinese’, depicts an interior drawn in inverse perspective with the tip of the vantage point in front of the picture plane. 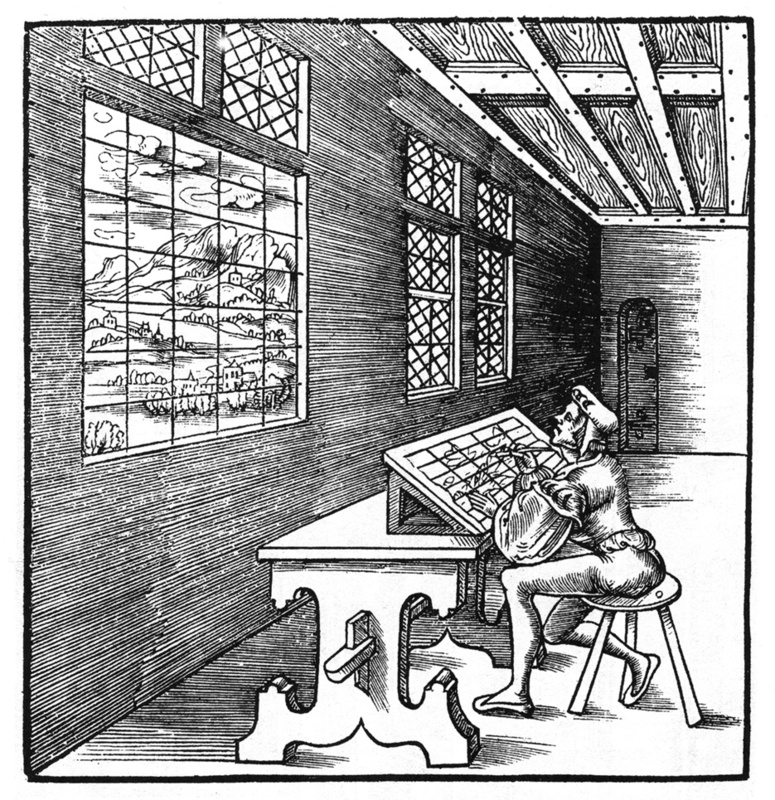 The right image, which he calls ‘Leonardo’, shows an interior in linear perspective with the tip of the vantage point on the horizon, behind the picture plane. The middle image shows no interior but a diagonal cross. Here he introduces a third space which is actually a synthesis of the right and the left image with their opposite vantage points. The caption reads: “This is the perspective representation of a pyramid. Where does the tip lie? In depth or in front?” From our frontal point of view, as a beholder, we can’t discern this and answer his question. It seems there exists a space where both possibilities co-exist. The question bluntly confronts us with one of the main fundamental laws of Suprematist space where definite answers about the exact location of geometric shapes cannot be given and stay ambiguous. In the left image of the second diagram Lissitzky renders perspectival space ‘spatial’. Here we see, as it were, the real nature of the picture plane arise. The two vantage points of the visual pyramids, one in front and one with dotted lines in the back, are made visible. For him this space is enclosed by perspective and does not define space in a fundamental way. So to attain Suprematist space he has to go a step further and apply another action which he describes as follows: ‘Suprematism has advanced the ultimate tip of the visual pyramid of perspective into infinity’. This is what we see in the right image; Lissitzky has dismantled linear perspective. The vantage points have been pried open and the existing lines, which once formed the edges of the visual pyramids, have been pushed outwards until they run parallel. He goes on by saying ‘that Suprematism has swept away from the plane the illusions of three-dimensional perspective space, and has created the ultimate illusion of irrational space, with its infinite extensibility into the background and foreground’. See the essay ‘Radical Reversibility’ published in the magazine ‘Art in America’, April 1988. It has to be remarked that Bois is focussed on the opposite positions within the reversibility of Lissitzky’s art. In his belief these positions can’t be overcome, whereas we think that Lissitzky envisioned higher forms of inclusion, more like a productive coincidence of opposites. If one takes the current state of our visual culture with its narcissistic traits serious and see how it is embedded in a long history of depicting reality, one has to be grateful for the wit and perseverance of El Lissitzky in pursuing a visual language which breaks with this history. Even if we know that in his last years he resorted to making propagandist art for the Communist regime. His Proun experiments weren’t just Modernistic exercises to make beautiful geometric drawings. He was genuinely after a higher comprehension and awareness of space. At the end of his essay he hints to this new era in art, one which ‘should effect the destruction of the old idea of art, that of monumentality’. He was in search of an art which didn’t depend on lasting a hundred or a thousand years, but on ‘the perpetual expansion of human achievement’ itself. Instead of being focussed on a kind of earthly permanence, with the only goal of inscribing oneself or artworks in history, he is drawn to a more profound engagement with the world which goes beyond ‘terrestrial’ relationships. In his words, it is a ‘progression [that] consists in our being led to consider certain views as obvious and necessary which our forefathers considered as incomprehensible, for they were incapable of comprehending them’. El Lissitzky, ‘Proun– Not World Visions, But World Reality’, 1922. From Sophie Lissitzky-Küppers, El Lissitzky–Life, Letters, Texts, Thames and Hudson, London, 1968, p.343. This quote is taken from Yve-Alain Bois’ essay Radical Reversibility. Soho Machida, Great Thinkers of the Eastern World, Harper Collins,1995. Machida explains the concept of ‘Basho’ of philosopher Nishida Kitaro which ‘defines this existential transition of the self as one ‘from that which functions to that which sees’. Exactly this thought is elaborated by the Japanese philosopher Kitaro Nishida in his essay ‘From the Acting to the Seeing’ from 1927. He writes: “I want to conceive, from the root of all things, a seeing without seer”. Let’s find out if an emphasis on this mode of seeing, which goes beyond our current concepts of space and time, changes the ways we experience, think about and represent space. Therefore we should strive for other models of visualisation which are more based on our sensory perception and imagination. One needs to analyse our current visual culture and treat new technology not as an end in itself but as an opportunity to re-define ourselves and our relation to the world.